Turning the notion of conventional theatre upside down and blurring the boundary between audience and artist BE Festival opens its doors to 20 of Europe’s most daring, innovative and experimental theatre, dance and circus groups this June. The week long festival take place across the Rep’s various stages and back-stage areas and offers a unique programme of European theatre, dance, comedy, circus, music, visual and performing arts. Running day and night there are a wide variety of activities and shows for everyone. 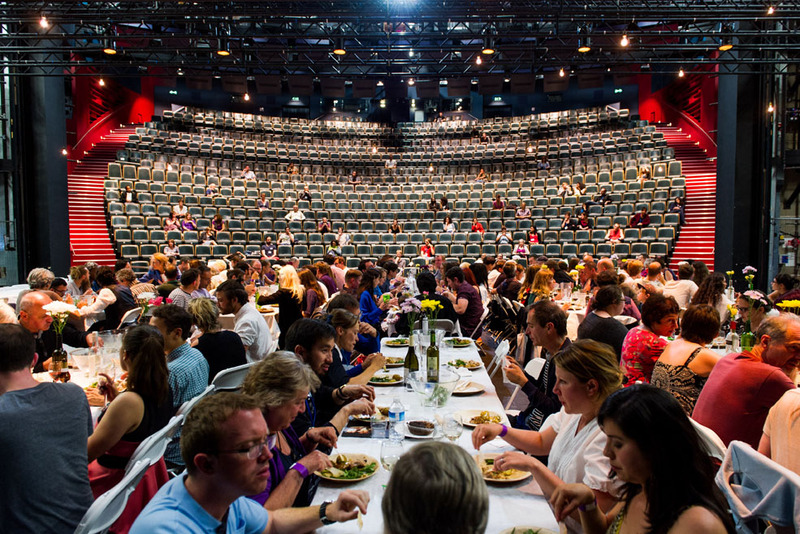 One of the festival’s many quirks include their now infamous interval dinner events (pictured); The REP’s main stage makes way for a pop-up restaurant and audience members, actors and staff are invited to enjoy a meal together under the spotlights during the interval. Evening entertainment also includes international live music, DJs and a bar; the perfect place to relax on the loungers and sofas, soak up the atmosphere and enjoy the shows. During the day there are visual arts installations, workshops and talks all exploring the theme of democracy and participation giving audiences the opportunity to chat with actors, artists and academics. A free outdoor performance, Collage, by trampolining forces of nature, Bot Project (Spain), will take place on Centenary Square on 24 June at 6pm. This entry was posted in Birmingham, Theatre and tagged BE Festival, Birmingham Rep, European THeatre, The Rep, Theatre. Bookmark the permalink.